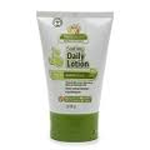 As the term babyganics implies, this item is totally organic, which makes it great for a baby’s skin. It comes in a tube like sun screen and they provide you with a generous amount considering how expensive organic items usually are. I bought this for my baby thinking that it would help with his eczema, but I was disappointed with the results. It worked well as a lotion and his skin was less dry, but it didn’t stop the pervasive itching and scratching that he always had to deal with. I feel really bad for my baby and want to help him out but this product won’t do it for me. It is hypoallergenic, steroid free and free of all toxins present in other adult products, as well as being totally organically composed. I think the idea behind this product was to sort of coat the child’s skin so that it has a barrier between the skin and the weather outside. This is a nice idea in theory, but it doesn’t seem to work so well in many cases, particularly in my case. Perhaps it is because it is meant for children that it was so weak in dealing with the actual problems I hoped it would, but I don’t dare use an adult product on my child. I can only hope that it ends up working better for others than it did for me.